​As difficult as it may be to contemplate, a decision will need to be made about how you wish your cat to be laid to rest. Having an idea of the options available in advance may take some of the pressure off you at the time of euthanasia. For this reason I compiled a guide to help you understand the available options for laying your cat to rest and some ideas about choosing a suitable tribute if you are that way inclined. Everybody deals with grief in their own way and in their own time. Allow yourself the right to grieve the way that feels best for you. Don't be afraid of your feelings - grief is a way of moving forward to an acceptance of your loss and allows you to love again. For some people, losing a cat is like losing a best friend or family member. I know a tear is never too far away when I recall the many pets I have loved and lost over the years, but I always rest assured that I am lucky to have had the privilege of sharing my life and love with my animals. The grieving process tends to occur in stages but there are no hard and fast rules. The first stage is disbelief and shock. It may be hard to accept the animal is no longer with us and the house may feel very empty. The next stages are pain, anger and depression. This is the time you need the support of family and friends and a listening ear. Many people will experience feelings of guilt; ‘Did I do the right thing? What could I have done to prevent it?’ This is normal and will subside in time. The last stage of the process is acceptance. You have accepted the reality of the loss of your pet and can now look back with happiness on the many good memories of your time together. Children can be devastated by the death of a family cat. It is best to be practical and upfront when an animal dies an to tell the child that it is natures way - like with people animals are born, they live their lives and they die. It is better not to give them false hopes by suggesting that they are just "asleep" or they will expect them to wake up and be alive again. This may only cause more pain when they realize this is not going to happen. It can be helpful to keep children busy with making decisions about what happens next. Providing a structured sequence of events will help them let go and move on. More advice on helping children to cope with grief available here. Keep their memory alive by sharing happy stories and memories with family and friends can be helpful. Putting a scrapbook together of favourite photos - draw and write about any of the memories you have of your cat … funny things they did, where they liked to sleep, tricks, favourite foods, naughty things they did etc. Make a donation in your cat's name to a needy cat charity or sponsor a kennel at a rescue centre in memory of your cat. If you feel you are ready, consider offering a loving home to a cat in need - rescue centres are full to bursting with cats in desperate need of a chance at finding a loving and happy home. There are several good children's books that can be a very gentle way of introducing children to the concept of losing a cat (see the link below for advice and books I recommend). 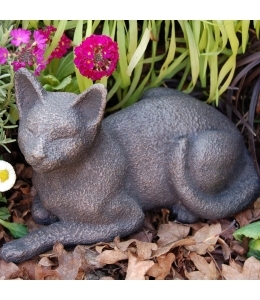 Create a memorial in your home or garden to remind you of the happier times you shared with your cat - this can be a physical monument or simply planting a flower garden or tree. Some people find a small memento (eg clipping of fur , a favourite blanket or collar) can help keep a cat's memory close. This is a not-for-profit website that provides support to pet owners around the loss of a beloved companion. It was set up by vet Shailen Jasani in July 2011 after the loss of his beloved cat, Ralph, following a motor vehicle accident in November 2010. The site is dedicated to all the animals that have touched and continue to touch the hearts of so many people. Offering a confidential Paws to Listen phone service that provides free emotional and practical help with coping with the loss of a cat. 'Absent Friend' by Laura and Martyn Lee, published by Henston (ISBN 1-85054-089-6). I am now stocking copies of this sensitively compiled booklet written by fellow vet Caroline Hewson. It is accompanied by a 15 minute audio CD that acknowledges the huge impact that losing a pet can have. It brings reassurance that you are not alone in your feelings at such a sad time whilst offering an alternative to books and helplines.